So you’ve graduated from pre-formed burger patties and hotdogs to true BBQ. You’re ready to take on one of the most temperamental cuts of meat around: brisket. For the effort you put in, the payoff is more than worth it. If you do it right, that is. Brisket is infamously tricky to cook correctly. Between trimming, smoking, wrapping, and resting, it can be a bit overwhelming at first. But fear not, we have compiled all the vital information you need to conquer your first brisket. The meat will taste like a million bucks, and no one will guess you’re anything less than a BBQ pit master. In the BBQ world, they say you should be able to fold a good brisket in half. While you might not literally fold your meat in half, a nice cut of brisket should feel “floppy” in your hand rather than stiff. This flexibility indicates a good balance of muscle and fat. Your brisket should be marbled throughout, so the fat renders into the meat and makes it tender. Be sure that the flat (the leaner part of the brisket) is thick enough to cook close to the same rate as the point (the thicker, fatter part). Any brisket you get from the grocery store or a local butcher will have a considerable amount of fat on it. Some fat is necessary to keep the meat moist during the long smoking process; however, you need to trim most off so your brisket isn’t too fatty at the end. Trimming is one of the most time-consuming parts of following a brisket recipe, especially if you don’t have much experience. You should try to trim the fat cap (the layer of fat that covers one side of the brisket) to about ¼ inch. Then thin out the fat wherever else it looks too thick, and remove the silver skin from the bottom. You may want to follow along with a video for some visual help. It seems like everyone has their own special rub they swear by. If you’re one of those people, by all means, season away. But if you’re looking for a rub with reliable flavor and all kinds of uses, then this might be the BBQ rub you want. Coat the brisket completely on both sides, massaging the seasoning into the meat a little bit just so it sticks. Don’t go overboard with the rub—you want the meat covered but not caked. The best way to cook brisket is low and slow. You should preheat your pellet grill to 250° F or Hi Smoke and cook the meat until the internal temperature reaches 160° F. Cooking times for this vary based on several factors, so it’s best to monitor the temperature rather than the amount of time that’s passed. You can estimate 10-15 hours total cooking time for the entire brisket. Camp Chef’s Smart Smoke Technology makes smoking easy: You don’t have to babysit a fire to keep the right temperature, and the burning pellets create the optimal amount of smoke. You can set your wireless thermometer to alert you when it has reached the desired temperature. Smoking brisket has never been simpler. Seriously. Around 160° F, your brisket will hit a point called the stall. This is when the internal temperature plateaus for a time while the meat releases moisture, sometimes for a couple of hours. If you let it continue cooking, the brisket will get through the stall and the temperature will start rising again. If you’re impatient for delicious brisket, you can use the “Texas crutch,” a.k.a. aluminum foil or wax-less butcher paper, and break the stall more quickly. A foil wrapping will speed up the cooking and retain more moisture, which is why we recommend it. You can try to leave your brisket unwrapped, spritzing it occasionally for moisture, but it is more likely to dry out. When your meat probe thermometer reads an internal temperature of 190°-205° F, it’s time to rest the brisket. Remove it from the heat and (if it isn’t wrapped already) wrap in aluminum foil or butcher paper. Let rest for at least an hour, so the juices settle in the meat. If you need to keep it for longer, you can rest it in a cooler for two hours or more. When your brisket is finished, it should have a dark, mahogany crust on the outside—this is called the bark. Cut into thin slices, about ¼ inch, against the grain. As the brisket comes apart, hold up a slice. It should hold under its own weight, but fall apart easily with a gentle pull. That’s when you know it’s perfect. Pick up the 9-Piece Knife Set for a tried and true cut, every everytime. As with anything worth doing in life, practice makes perfect for cooking and following a brisket recipe. But we do have a shortcut for you: Camp Chef Pellet Grills. 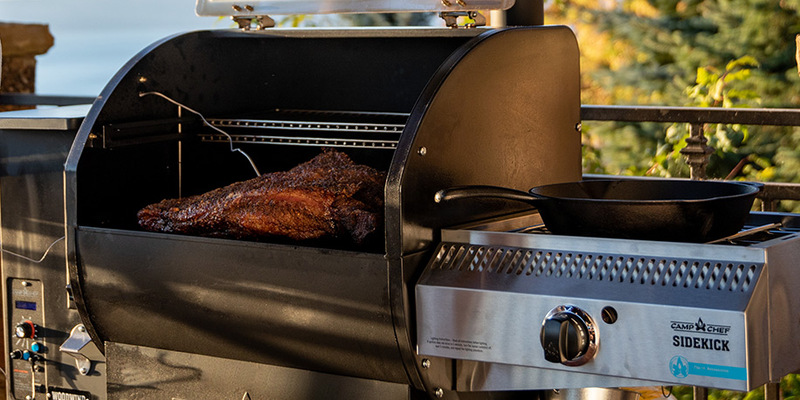 With the Smart Smoke Technology, optimal smoky flavor, and convection-style heat, you can easily cook a tender, juicy brisket on your first try. Just follow our recipe, and enjoy the SmokePro results. Our favorite here at Camp Chef is our All Purpose Seasoning. But it all depends on what kinds of flavors you like! Some people swear by their own custom rubs. Try a few different kinds to see what you prefer–but for a good place to start, we recommend the All Purpose. I know you need or want to sell your seasoning, but if you check with most of the best pit bosses you will find they simply use salt and pepper only as a rub. This gives a good bark and lets the flavor of the meat and the smoke come thru. I have been cooking briskets for over 40 years and have tried different rubs in the past, but just use salt and pepper and cook over a combination of mesquite and post oak. I haven’t found anything that can beat this. We’ve tried a few different rubs and styles as well. The office favorite is actually the All Purpose Seasoning, but salt and pepper certainly works well if that’s your preference!